In Eastern Uganda, near the city of Mbale, there lives a community of around 600 black Ugandans, who have practiced Judaism for generations. They observe Jewish holidays, keep the Shabbat holy, eat according to Kosher law and say (and - more importantly in the context of this review - sing) Hebrew prayers. The Abayudaya, as this community is known, practice their religion in synagogues which are closer to African mud huts than the buildings usually associated with that designation, and in similar syncretic fashion, their music is an expression of the Jewish faith, in the rhythms and harmonies of East Africa. Had this disc arrived at my house without packaging, I’d have assumed on listening to it that it was a collection of field recordings of African village music, various items on a continuum from the very traditional to the more modern, from unaccompanied solo voice or group singing, on to acoustic guitar and even a small electric band. But that view would have primarily reflected my own limitations - in the booklet notes, I learn that some songs 'are sung to melodies that would be familiar in many North American synagogues'. While I didn’t recognise this, a listener familiar with Jewish religious music would presumably make the connection, just as a reviewer like myself, because of my cultural background, will sometimes spot a Christian hymn tune used for a song in an African language (and actually, to complicate things still further, there are songs here which also have that influence). We all know how that happened. Christian missionaries were as much part of the colonial drive in Africa as were the military and economic aspects. How did a community of Jews - in faith if not in ethnicity - come to be located in the hills and valleys of Eastern Uganda? The story is told in the booklet notes, and I offer the following summary. The Abayudaya community was founded by Semei Kakungulu, a Baganda military leader who had worked with the British around the turn of the 19th and 20th centuries. He became disaffected with the British, and rejecting Anglican teaching, joined the dissident Protestant sect known as the Malakites. This group based their faith and practice on a literal reading of the bible. Kangulu took this a stage further, particularly in relation to ritual (such as circumcision - he even circumcised himself) and finding himself closer to Judaism made the conscious step of embracing that faith. Around 3000 of his followers went with him. The music developed accordingly, with Kakungulu himself adapting the music from Malachite worship. Sporadic contact with mainstream Judaism from the 1920s onwards led to the gradual assimilation of more Jewish practices, culture and doctrine - and at this point they ripped the New Testament from their bibles. It isn’t difficult to imagine the difficulties all of this must have caused them - isolated from any other Jewish communities, ostracised and even persecuted by both the Muslim and Christian communities and denied educational opportunities because the schools were all run on religious grounds. Idi Amin deliberately suppressed the Abayudaya - even their funeral services were banned - and while committed members carried on their observance in secret, others abandoned the faith, leading to the even smaller number of adherents today (and yet they still apparently span no less than five Bantu ethnic and language groups - Baganda, Basoga, Bagisu, Bagwere, and Banyole). The isolation must have been a key factor in the development of the Abayudaya’s characteristic music. Indeed, the inlay card picks out a quote that asserts "We have been saved by our music." Malakite music is one element, and the occasional contact with Jewish visitors from the outside world also left its mark, especially since the contact has become more formalised since the 1980s. In more recent years, contemporary Israeli and Hasidic music has been imported on cassettes, and one member of the community travelled abroad where he learned of Ashkenazi cantorial traditions. African popular music of various kinds, via the mass media (including Zulu music on Kenya radio) and also through local guitar music traditions, have evidently also had an influence. And underpinning it all, there’s the traditions of their ethnic groups, such as the Basoga ngoma (drumming songs) or contemporary folksongs accompanied by the dungu (a nine-stringed harp), which they continue to embrace so long as it’s in aspects where there’s no conflict with their religion. Anticipating the possible charge that there is nothing very Jewish about some of this, the compiler quotes the ethnomusicologist Curt Sachs who has said that Jewish music is music made by Jews, for Jews, as Jews. Which makes sense to me. The first two tracks nicely illustrate some of this diversity. The opening track, Psalm 136, combines recordings of both an unaccompanied vocal version (as sung during worship) with a version accompanied by a small band of electric guitars and keyboard (as it would be done in a celebration). Track two, Katondo Oyo Nalimana (God Is All Knowing) is a traditional Basoga song, with drumming accompaniment - one large drum, one short, laced drum and one shaker, made from a bean-filled tin can. 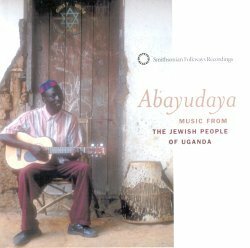 The singer Basiki Walugo, an Abayudaya elder in Namatumba, improvises verses, encompassing references to Judaism, making this very African song into a Jewish one. As a listener, then, you can enjoy this music on a number of levels. As I said earlier, if you didn’t know anything about the Abayudaya, you could simply listen to and appreciate this as a varied set of field recordings from a particular corner of Africa. Equipped with the booklet notes, you can penetrate further into a music that is clearly deeply spiritual, with translations such as "God creates and then destroys. I don't know when I will die. Death is powerful. While you walk, it follows you. I don't know where I will be buried. Even if you board an airplane, death also boards. Even if you get into a car, it also gets in. Even if you are riding on a bicycle, as you ride, it also rides with you." You could lay some of these lines out on the page like poetry and it would work. Other translations are recognisable as psalms (Psalms 92, 93 and 121 are among those that are identified, for example), even if sung to recently composed melodies, or even show their roots in Pentecostal songs, like 'I am a soldier in the army of the Lord', presumably harking back to the earliest days of the sect‘s development. There are some survivals of tunes used by the Malakite sect. Others still, while they seem on the face of it to reflect traditional African concerns, carry a metaphorical meaning in Abayudaya practice. One example of this is Kabbila (The Patch of Forest), a folk song about hunters chasing an animal in the forest, but which an Abayudaya teacher expounds as encouraging children to chase after their goals in life. In some songs, the Jewish connection is more explicit - the prayers Kiddush and Motzi, were brought by North American visitors, as well as having been heard by one of the community on a visit to a Nairobi synagogue. Whatever way you choose to approach this music, though, it has an emotional power and an appeal which reflects the deeply felt faith it expresses. Anyone with an open mind should be charmed and captivated by it.